Counting Scales are commonly used to save time, increase quality and accuracy and eliminate errors in many different areas, from general engineering, stores and packing operations to healthcare, electronics and more general stock taking applications. By offering only industrial counting scales with an extremely high internal resolution we offer unrivalled accuracy for your money. If you currently count large numbers of small items by hand then look no further, we have a parts counter for every job from reputable global manufacturers Salter Brecknell, Ohaus, Adam Equipment and UWE. The ability of a counting scale to work accurately relies on the internal electronics of the machine to be able to clearly and accurately interpret the weigh cell’s electrical signal into many small parts, sometimes as many as 1,000,000 parts. This is called the internal resolution, and it enables the scale to very accurately calculate the weight of 1 item from within a small initial sample of 10 or 20 items. Once this Actual Piece Weight (APW) is determined, counting of large number of items can begin and very accurately even after 1000’s of items have been added, the scale will still detect the addition of just one more piece. 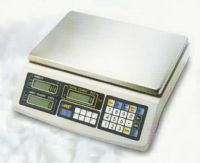 One common application of scales for weighing and counting is the dual counting platform solution. A high resolution counting machine is used as a sampling scale and a much larger scale, connected to the sampling scale via a load cell input, usually with a capacity anywhere from 5kg up to 1,500kg is used for counting in bulk. Whatever your application is, just give us a call on 0800 987 5300 to chat through the possibilities we have someof the industries leading brands such as Salter Brecknell, UWE and Ohaus balances available. You don’t always have to remove a small sample from your bulk load to add to the counting scale to start the process. For counting machines that have reverse, or negative, parts counting software you can start with the bulk load and remove a sample from the container to start counting. This is particularly efficient for making up say bags of components from a bulk box, provided you know the weight of container so you can enter the tare value or you have an identical empty container to tare off first.